Ravenscraig- or The Craig as it is more affectionately known, a giant in the history of Scottish steelmaking, may never have existed had plans for expansion with a new fourth blast furnace at Clyde Iron works (owned by Colville’s Ltd) gone ahead. However, Colville’s wanted to convert its Dalzell Works in Motherwell to hot metal working, and so the plans were changed. 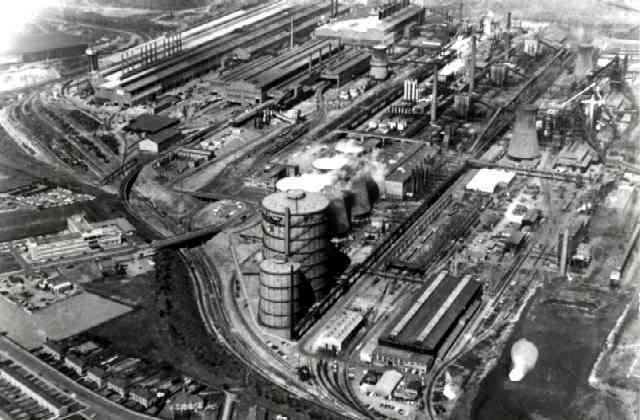 The proposed blast furnace would now be housed at a “new works” near to the Dalzell site on a green-field area flanked between Motherwell, Carfin and Craigneuk. The new site was surveyed in 1953 and a name suggested. Ravenscraig! At a cost of £22.5 million Ravenscraig took three years to build. Spanning one square mile, the site consisted of coke ovens, a by-products plant, one blast furnace and an open hearth melting shop with three steel-making furnaces. The coke ovens were lit on 3 June, 1957, the blast furnace on 1 Aug (after some preliminary heating), followed by the melting shop on 3 September of the same year. Production of an estimated 400,000 tons of steel per year had begun. Future expansions to the works would also include the fabrication of a semi-continuous Strip Mill completed in 1962. At its peak, Ravenscraig employed around 7000 workers and was one of the largest steelworks in Western Europe. “I had to move to Coltness because our tenement block was demolished to make way for the office block for Ravenscraig in Carfin Road. My Gran and Aunt lived in Meadowhead Road behind the huge blue towers.